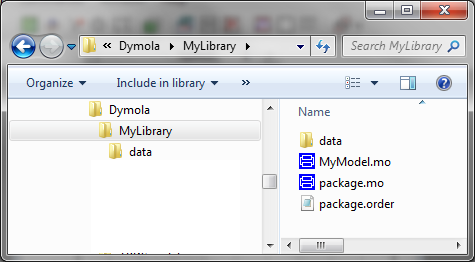 When creating your own libraries you may want to reference data files that are used within your model. However when another user installs your library they might install it in a different location so any links referencing the data files have to be done in such a way that they will work independently of where the library is installed. In the example above a clock is connected to a combiTable block. The table used in the combitable is stored in the data directory.